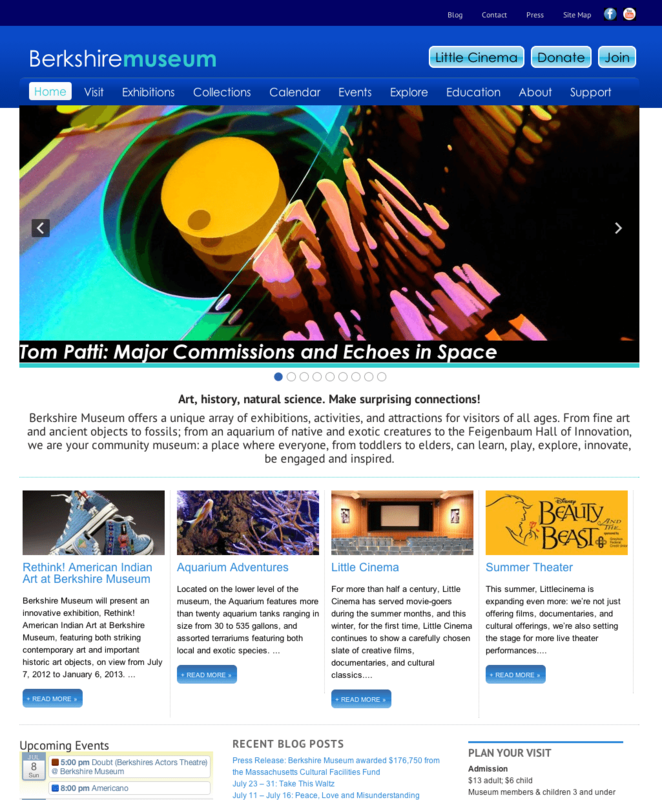 The New England Museum Association (NEMA) recently awarded the Studio Two designed website for the Berkshire Museum at BerkshireMuseum.org first place as the best website for an institution with a budget over $1Million. We’re pleased with this recognition, of course, but even more so as it validates our focus on building sites in a manner focused on rapid deployment with available commercial tools and design elements. The site is built in wordpress, incorporates theme elements from leading theme developer woothemes.com, and incorporates a number of elements that we have been finding really accelerate deployment, management and effectiveness of sites, including event management, custom post elements, effective use of post categories, and other techniques. In particular, the calendar tools generates a public .ics feed compatible with google calendar and other calendaring tools, allowing us to embed the Berkshire Museum events into other regional sites we manage, such as the one at lenox.org. Kudos to senior web designer Christine Cooney for her outstanding work on the site design, to Kaitlyn Pierce and Jason Toews for their help in content management and programming, respectively, and to Lesley Beck, Director of Marketing at the Berkshire Museum and Jennibeth Gomez, webmaster at the Museum.